This is my first Tarte purchase and I was so curious about these skincare products. I decided to get these Tarte Maracuja C-Brighter Eye Treatment ($38) and Tarte Maracuja Neck Treatment ($44). 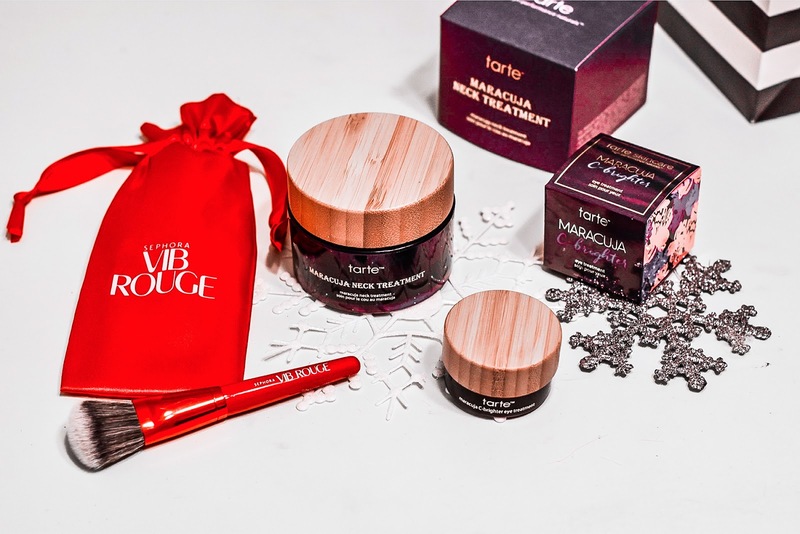 With this purchase, I officially became a VIB Rouge at Sephora, which means, I got access to not only free custom makeovers, but also free 2-day shipping with every order, private hotline and invitations to exclusive events. This is not an eye moisturizer, this is a rich but not greasy, daily eye cream that really smooths and hydrates my under eye area, according to label, it also brightens and fights visible signs of aging. 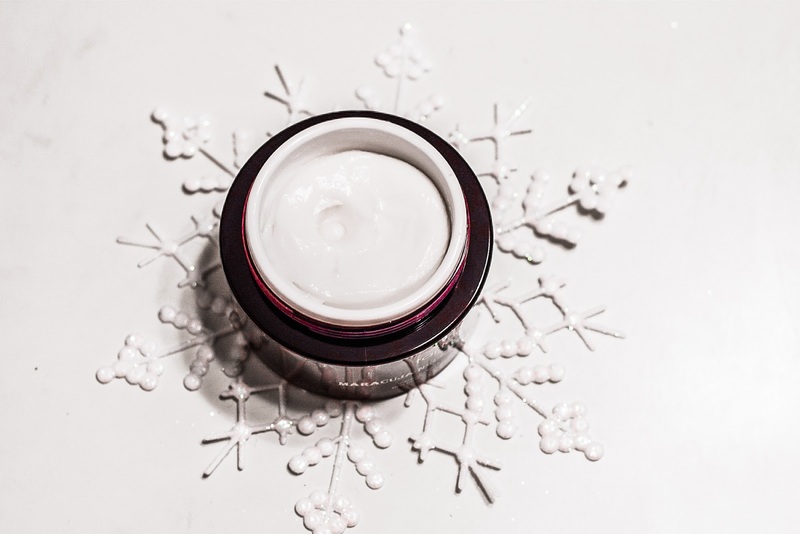 This Tarte Maracuja C-Brighter Eye Treatment is for someone with fine lines and wrinkles, Crow's feet and loss of firmness and elasticity. I like this eye cream, it noticeably smooths out fine lines around my eyes. Only thing is that it's not the best thing to use under concealer, I usually apply this in the evening before going to bed. In the morning I prefer to use an eye moisturizer under the concealer. Even though it's slightely scented, it doesn't irritate my eyes. This multitasking neck treatment is parabens and phthalaths-free and helps improve the appearence of skin on the neck and décolleté. This is even thicker cream than eye cream, but absorbs quickly. If you apply too much it will start pilling so I always use very small amount of this product and it doen't pill. This cream leaves skin so soft, and after using it for about 3 weeks, I notice significant decrease in the lines on my neck, they are kinda fading. Since this is my first neck cream I can't compare with any other neck cream, but so far I'm glad I bought it. I use on my décolleté too. Since I became VIB Rouge, I got this cute brush as a gift. I haven't use it yet but if feels very smooth, I' pretyy sure I will enjoy using it. Have you tried any Tarte skincare product yet? Which other product recomend for dry skin? Let me know in the comments below. Congratulations on becoming a VIB Rouge! I love that brush! I've only tried the neck cream and it is good. Thanks for the review babe, the products look amazing ! Thanks for sharing these products! Have a great Monday! Thanks for sharing these products! The packaging is amazing and need to try that neck cream. Dear Nina, I must confess that I seldom wear creams, but these ones caught my eye now -Tarte Maracuja C, what for a nicename and promising good results! I like when just a bit of cream is needed and that it absorbs well. I really liked your review, could well buy them :) Hope you have a nice week! Hugs! I've heard lots of good things about Tarte, great pictures too! Ive never tried Tarte before. Would love to try these bits out! Hi Nina! Happy new week! I always enjoy your reviews. Great gift ideas for family or friends as well. Thank you for sharing and have a blessed week! I haven't tried anything from Tarte but I keep seeing this brand in reviews all the time. I have oily skin but in winter I get dry patches all the time, due to the dry weather. I LOVE Tarte products too! They seriously are the best! awesome treatment! I love it! The neck area is so often neglected and so great choice buying a cream that specifically targets that area! Happy to hear you're pleased with your purchase :) Have a lovely week! Sounds like a great product! I love almost everything from Tarte! I have never tried this but I like Tarte blushes! Ok definitely need to try this, looks so good! 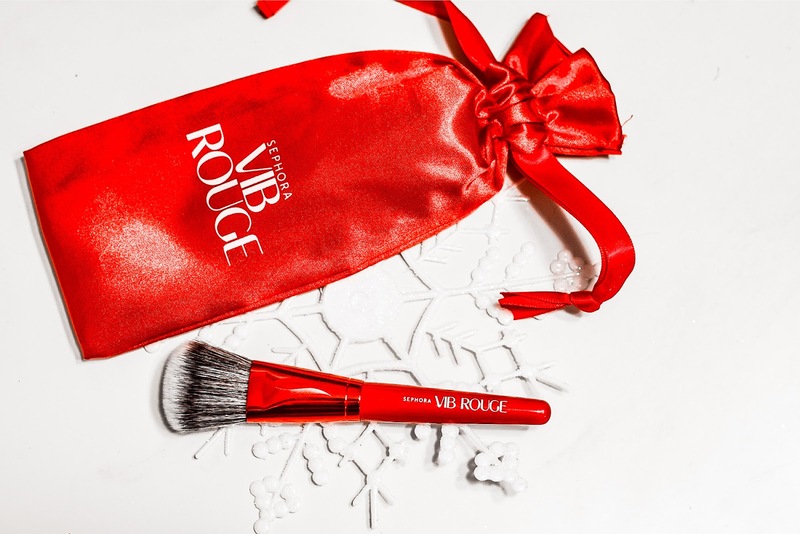 New goal, become VIB rouge! So many fun perks. Thanks for the review of these, they are both something I could use, especially the eye cream! WOW i love all these picks, Nina! Love your blog girl! Keep it coming! That eye cream sounds amazing! wow i really need that eye brightener! I haven't tried any Tarte products yet, but that neck cream sounds amazing. Love the brand Tarte! They also make a great bronzer and love their eyeshadows! 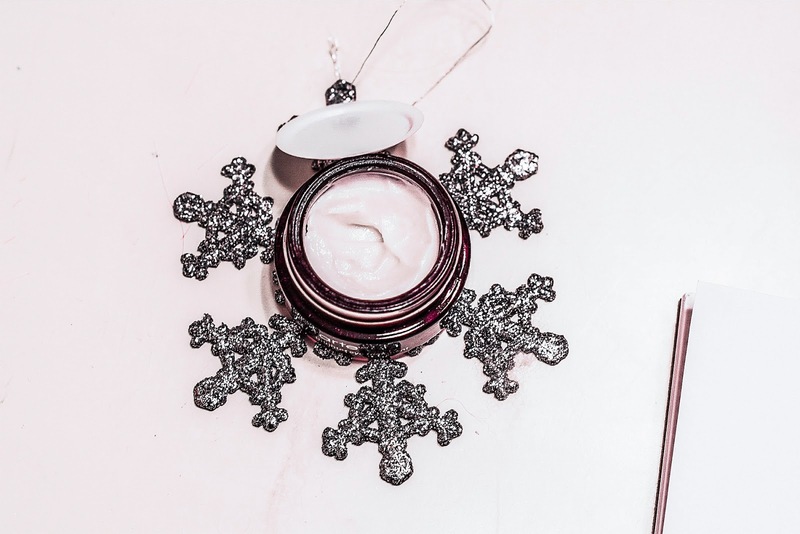 Omg, yes- love Tarte and need to look into this neck cream! Those products look fabulous! I didn't know the brand but I will deffo give it a try. these photos are beautiful. Love them all! Sounds like great products! It must be amazing! Thank you for sharing! I haven't tried any Tarte skincare product yet but this sound amazing. I love the sound of the eyecream - tarte is one of my favourite brands!